We have a number of base oils to select from when formulating a grease. Quite often the first way to start the product selection process is ruling out grease that doesn’t have the temperature capability that is required in your application. 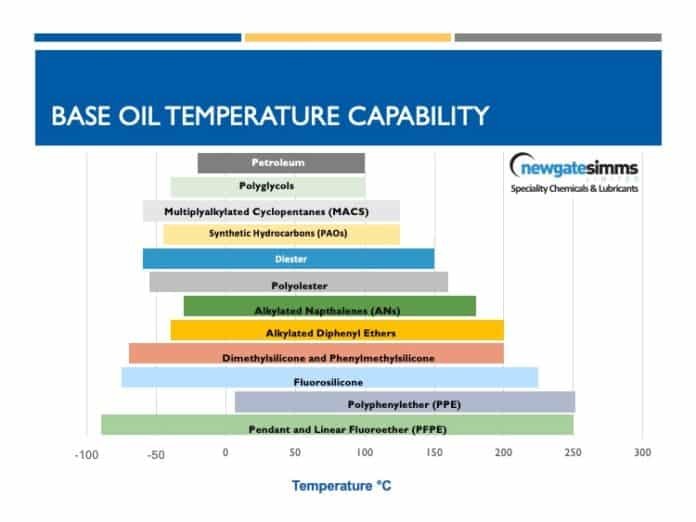 The chart featured on this page gives the reader base oil temperature capabilities; this information should only be treated as a rough guide or ‘rule of thumb’ to work from. When these base oils are used to create a grease, the thickener system will have bearing on the finished grease recommended service temperature range. Take a look at the characteristics of thickeners we most often use in our grease formulations.